June sees the arrival of summer and the fly fishing really starts to heat up around here! 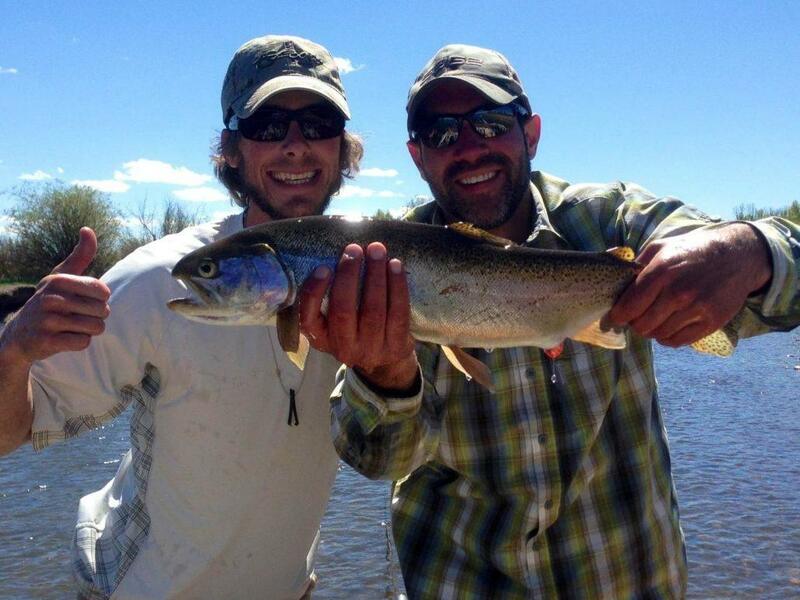 We refer to June as Trophy Trout season around Jackson Hole. The typical fly fishing day consists of quality catches versus quantity. We drive farther in June to reach the best waters, typically 1-1.5 hours. It’s worth it, some of the largest trout of the year are caught in June! Early in the month we focus on waters in Yellowstone National Park. The Firehole and Madison Rivers are a great bet the first two weeks of the month since water temperatures there are higher due to geyser activity. Prolific hatches of Baetis, PMD’s, Caddis, and even Stoneflies are fun to fly fish. 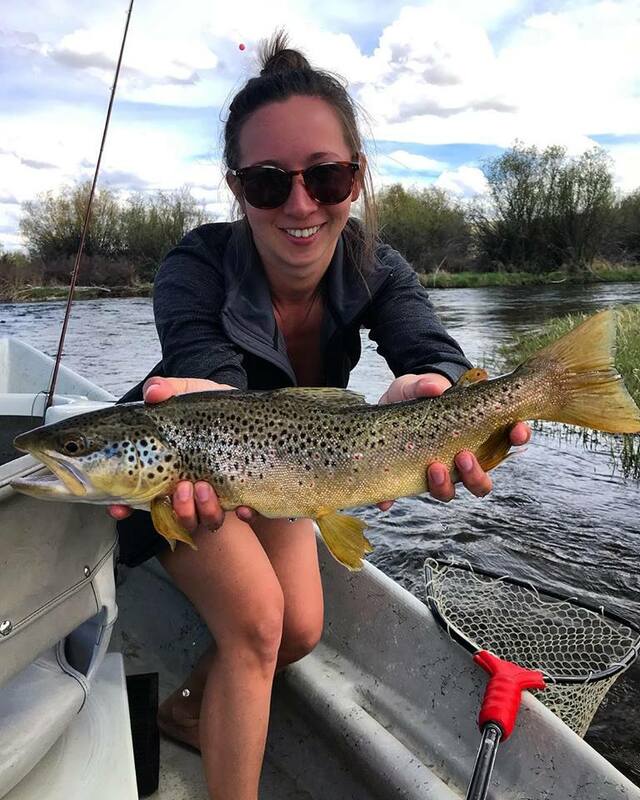 It’s a long drive from Jackson Hole to fish these rivers, roughly 2.5 hours, so these days are best combined with some sight-seeing in Yellowstone. Our fishing options expand even more with ice-off on Lewis Lake in southern Yellowstone, typically by June 1oth. This fine Brown and Lake Trout fishery offers up sight fishing to cruising Browns over sandy bottoms in the shallows or with streamers on sinking lines for large Lakers on the drop-offs. The different bays of this lake offer either Brown Drake or Caddis hatches depending on their bottom structure. The Lewis River has good Stonefly or Mayfly hatches and fishes well for large, picky Brown trout. We float both the Green and New Fork Rivers near Pinedale, WY in June as we watch flow levels. If we are in a warm spell and these rivers are rising, then we will fish elsewhere. If the flows plateau or begin to drop some, we come back to chase trophy Brown trout, even in murky waters. Brown trout are a light sensitive fish and actually can prefer water that is off-color. Often our best catch of the season comes from one of these two rivers in the month of June. Somewhere in mid to late June, both of these rivers start to clear. Typically the New Fork clears first and explodes with hatches Golden Stones, Caddis, and Grey Drakes. This river is a somewhat technical fishery and is best suited for intermediate to advanced anglers, but beginners can expect to catch fish also. Precise casting and mending are required to get these wary Brown and Rainbow trout to eat your flies! Our backcountry lakes and creeks become fishable after the first of the month as well. Soda Lake is a trophy Cutthroat trout lake and we are the only guide service allowed to guide there. It’s an effort to get there, but well worth it. This is sight-fishing to Cutthroat cruising the shallows, typically with nymphs or smaller Leech patterns. By mid-month some of our backcountry creeks are clear enough to fish and provide some solitude. This is dry fly fishing to native Cutthroat trout in a serene setting and typically you won’t see another angler all day. Average fish size is 8-14”, but the consistent action more than makes up for it. There are some “surprises” up to 20″ lurking in these creeks at this time of year as well. This involves hiking above 7500 feet in elevation, for up to 5 miles round trip. New for the 2018 Summer season, we have access to creeks and rivers in the northern part of the Jackson Hole Valley. A couple of these creeks clear quickly and hold nice Cutthroat trout up to 18″. This is dry-fly fishing for native Snake River Fine-Spotted Cutthroat trout.